Buy-one-get-one FREE deals and other yummy discounts for National Burrito Day Thursday! PHOENIX — Thursday, April 4, is National Burrito Day! Get ready to eat up these deals! Panda Libre is a new Mexican and Asian fusion restaurant in Gilbert, offering $5 for burritos that are normally $8 to $9 each. Plus, kids will eat for 99-cents, normally $4.99. The site shows that every Thursday, kids can eat for 99-cents, with a purchase of a regular-priced burrito or bowl, and it's a limit of one kid's meal per adult meal. 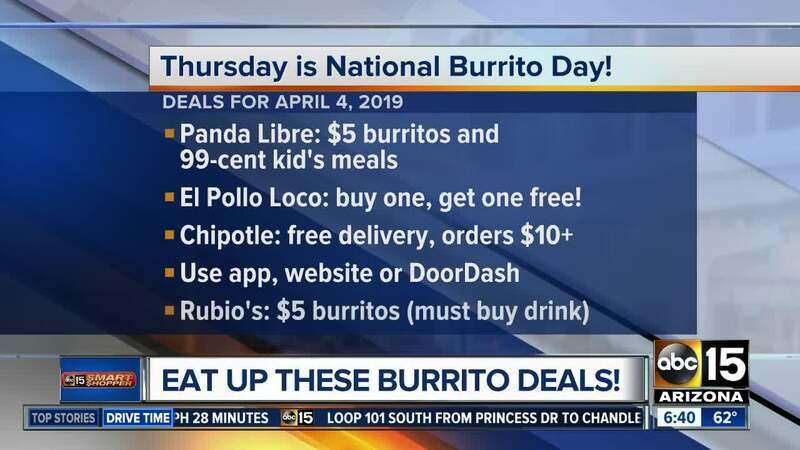 However, this National Burrito Day discount is better because you aren't paying full price for your adult meal. So, don't miss it! El Pollo Loco has an offer on Thursday: buy one burrito, get one FREE! The burritos typically range between $6.29 and $6.49. Click here to find a location near you. At Chipotle, get free delivery on all orders $10 and up through the app, website or DoorDash on Thursday only. Go here to find one nearby. Rubio's Coastal Grill is offering $5 burritos with a purchase of a drink. You'll need this coupon to score the discount. Uberrito is offering $5 burritos all day to celebrate. Extras are still extra (double meat or seafood, queso, guacamole, avocado, and/or bacon). This deal cannot be combined with any other offer and is not valid on delivery. What other deals are out there for National Burrito Day? Let me know so I can add them to this list!